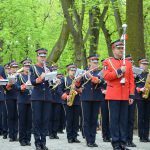 The Youth Brass Band from Mykanów along with Majorettes Presto in recent years has managed to conquer the hearts of the public not only in the home country but also in Europe and the Asian continent. In their repertoire, they combine classic, parade and entertainment pieces, thanks to which they are able to win the favour of every listener. The performances of the Youth Brass Band from Mykanów under the direction of the bandmaster Krzysztof Witczak are not only a great play, but also a feast for the eyes. The members of the orchestra look very elegant in their uniforms, while the majorettes have a whole range of different outfits that they present during performing choreographic arrangements accompanied by music. The marching show is an extraordinary performance, during which the orchestra simultaneously plays a bunch of songs and performs an effective choreography with majorettes. This type of performance is a unique form of the show, for which the Youth Brass Band from Mykanów was repeatedly appreciated at competitions in Poland and during foreign festivals. In addition, the orchestra takes part in various types of marches, highlighting parades and state celebrations. By deciding to sponsor the Youth Brass Band in Mykanów, you help us in our continuous development and enable us to fulfil our musical ambitions. In addition, you contribute to enriching our artistic offer. We are grateful for any form of help and that is why we turn to you with the possibility of cooperation. All interested: companies, institutions and individuals are encouraged to cooperate.